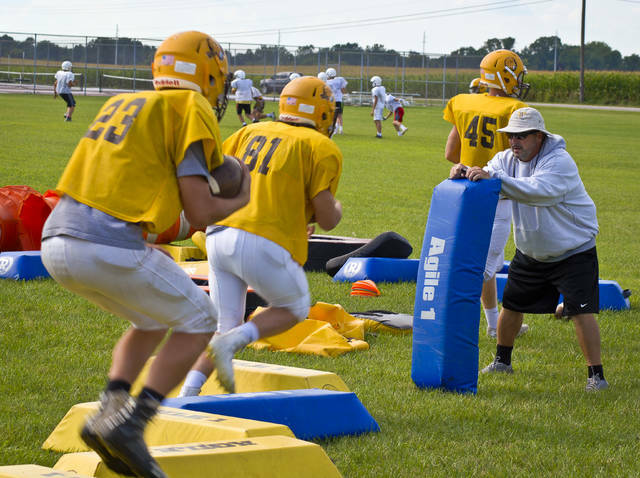 Buckeye Valley’s football team was working hard Wednesday afternoon getting ready for Delaware Hayes this Friday night. During warm-ups, Head Coach Matt Stephens held up an agility bag for his running backs to dodge as if it was a tackler from the opposing team. The Barons and Pacers will square off at 7 p.m. Friday at Cornell Stadium to open the 2017 prep football campaign. Other games around the area on Friday include Big Walnut at Johnstown Monroe, Hilliard Darby at Olentangy, St. Joseph (Ottawa, Ontario) at Liberty, and Olentangy Orange at Worthington Kilbourne. This entry was tagged Buckeye Football, delaware, Practice. Bookmark the permalink.